A lot of people do not like their removable dentures because they struggle with the maintenance, the slipping, and the food restrictions – they just want to eat an apple again without trouble ! Lower dentures are even more challenging than top dentures because your jawbone gradually changes shape, becoming flatter, once you have teeth extracted. your bone is not stimulated any longer, so that leads to bone loss. 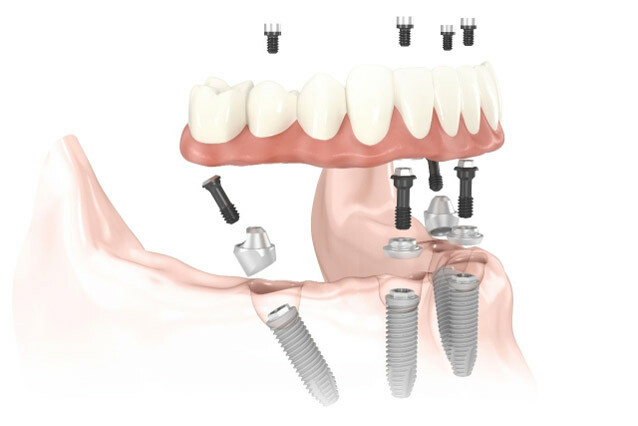 What do All-on-4 Dental Implants cost ? Dental implants offer a reliable solution to the problems faced by people who need to get replacement teeth without the drawbacks of dentures. However, if you wanted a full arch of teeth, you would typically need around 6 to 8 implants to support a full arch of teeth ( crowns would be more exact), and that would cost a lot of money from $7,000 to $40,000 and it will take a lot of time and some pain from you. Instead of going through all of that, modern implant dentistry has an effective solution : the all on 4 dental implants. Developed by Portuguese dentist Paulo Malo and Nobel Biocare, this method with all-on-4s has revolutionized tooth replacement because this technique is a much more affordable and time saving way to get a complete upper or lower arch of teeth. How ? Instead of using 6 or 8 implants for a full arch, these artificial teeth can be supported by only four precisely placed dental implants. To be able to support a full arch, the 4 implants must be placed very precisely : two implants will be placed in the front of the arch where your incisors usually are and then two implants will be placed beside them. These last 2 are placed at 45 degrees, tilting away from the front. This way, you will get the best support for the replacement teeth. Four implants are all you need to support the entire arch of 12-14 teeth. This isn’t an option for everyone of course, but for people who are missing a large number of teeth on the upper jaw or lower jaw, it can be a good alternative to investigate. Cost is one of the biggest sticking points for many people who need dental care, so we decided to put together some of that information, based on real-life procedures. As you can imagine, because we don’t need as many implants, the price is less high. As a reminder a full arch with 6 implant cost anywhere between $17,000 to $40,000. So with fewer implants, you already know that all-on-4 dental implants cost less than with the tradditional techniques that require at least 6 to 8 implants. An upper or lower arch using the all-on-4 system, in the US, will generally cost between $7,000 and $24,000. Getting All-on-4s is obviously an investment that will positively influence your appearance and your overall health. In some cases, you may be able to have some of the cost alleviated by dental insurance. However, most companies won’t cover all of it and will instead cover a small fee. This is because, even though there are health benefits, this is still classified as a cosmetic procedure. Remember that nothing in life that is worth having comes free or cheap, so you will want to look into dentists or oral surgeons that offer deep discounts. It could be that the dentist isn’t experienced or they don’t use quality materials from reputable manufacturer. Make sure your dentist use famous brands of dental implants because if you case requires a replacement for whatever reason 5-10 years later, it will be much easier to find the suitable component from the same brand. If the price is still too high, remember there are also some ways to get cheaper implants that will save you some money. Going with someone who is well known will also allow for better treatment if something goes wrong. Bone is preserved: Dental implants preserve the bone in your jaw so that it can stay strong thanks to the stimulation when chewing. Dentures actually accelerate any bone loss or weakening in your jaw because they simply sit on your gums and don’t stimulate your jawbone, which leads to bone loss with time. More Comfortable: Your teeth are supported by solid implants, not gum tissue, so you won’t get contact sores or friction marks on your gums. Diet Benefits: Dentures limit what you can eat because you can’t have anything too hard or too crunchy as it could break your dentures. They also cover your palate, which means you won’t taste things as much. Implants allow you to eat almost anything you want and taste everything as it is meant to be tasted. Self-Confidence: Implants don’t move around when you speak or when you eat, so you don’t have to be worried about embarrassment. They also help with spitting problems and speech concerns. Improved Aesthetics: Tooth and bone loss can actually influence the way your face looks because you don’t have the bone to support it. All-on-4s help to replace the original height between your upper and lower jaws so that your lips and cheeks are fuller. Say goodbye to the gaunt look! Application: Implants permanently fix your teeth in your mouth, so you don’t have to worry about messy, expensive adhesives. Here is a very detailed video of the procedure ( for dentist training ) for your information so please note that it might be a bit too “detailed” for sensitive patients. First, your dentist or oral surgeon will likely run CT scans and dental x-rays to evaluate your mouth and measure how much bone you have and how dense that bone is. If the tests indicate the amount of bone is not enough, you will likely have to get some bone grafting to make your jawbone stronger and help with the integration process. They also might use more specialized software to help them create surgical guides as well that they will then use in the surgery to locate excatly where they need to insert the posts. Prior to surgery, a denture that is temporary is created so that it can be personalized to fit onto the posts that are placed. The process is quick as there are only four titanium posts to fit, and you leave with everything in place. Of course, your current teeth are only temporary and the implants will need time to heal and fuse with your jawbone. After three to six months, everything should be fully healed. Once that happens, your dentist will remove your temporary teeth, and place your permanent dentures (made from prior bite impression) that will be stronger and more comfortable. Oral surgery, just like any other type of surgery, carries some risk. The success rate for implants is around 95%, but with all-on-4s there can still be the very same problems that can occur with implants such as failed osseointegration. It is important to make sure that you keep everything clean and free from plaque and food debris. You should continue to follow up with regular check-ups and professional cleanings. Together with a healthy diet and good products, any risks can be minimized. All-on-4s do require a certain amount of expertise, so you need to choose the right dentist to do the job if you want a stress free dental journey.